Navarro, J.; Sancho-Asensio, A.; Garriga, C.; Albo-Canals, J.; Ortiz-Villajos Maroto, J.; Raya, C.; Angulo, C.; Miralles, D.
Robots and automation systems have become a valuable partner in several facets of human life: from learning and teaching, to daily working, including health monitoring and assistance. So far, these appealing robot-based applications are restricted to conduct repetitive, yet useful, tasks due to the reduced individual robots’ capabilities in terms of processing and computation. This concern prevents current robots from facing more complex applications related to understanding hu- man beings and perceiving their subtle feelings. Such hardware limitations have been already found in the computer science field. In this domain, they are currently being addressed using a new resource exploitation model coined as cloud computing, which is targeted at enabling massive storage and computation using smartly connected and inexpensive commodity hardware. The purpose of this paper is to propose a cloud-based robotics architecture to effectively develop complex tasks related to hospitalized children assistance. 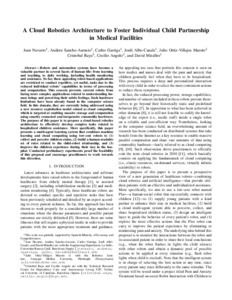 More specifically, this paper presents a multi-agent learning system that combines machine learning and cloud computing using low-cost robots to (1) collect and perceive children status, (2) build a human-readable set of rules related to the child-robot relationship, and (3) improve the children experience during their stay in the hos- pital. Conducted preliminary experiments proof the feasibility of this proposal and encourage practitioners to work towards this direction. Navarro, J. [et al.]. A Cloud robotics architecture to foster individual child partnership in medical facilities. A: IROS Workshop on Cloud Robotics. "Cloud Robotics Workshop in 26th IEEE/RSJ International Conference on Intelligent Robots and Systems". Tokyo: 2013.